Beautiful pre-designed cakes available in a range of colours, flavours, and sizes, with prices starting from $195. Check out the designs available below and enter your choice of design and options in the order enquiry form. Once Andrea has received your enquiry she will call you back to confirm pick up details (or delivery) and process your payment by credit card. Or you can call Andrea directly on 0400 743 848 between 9am-5pm Monday to Friday and 9am-2pm Saturday. All standard budget cake designs are on a tall single tier 6-inch or 8-inch diameter round cake and are made to order. Delivery available or pick up from Cakes By Andrea in Shailer Park. Cake flavours available are Madeira (vanilla), Red Velvet and Chocolate. Cakes are frosted with delicious vanilla frosting and set on a fondant covered board so they look gorgeous and are ready to be displayed. All decorations are handmade by Andrea from sugar paste and are edible. 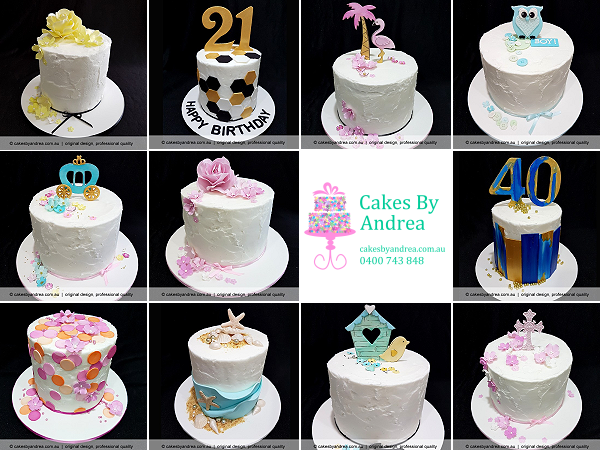 All cake designs are original, created and decorated by Andrea, and every cake is finished to the quality you see here. (1. 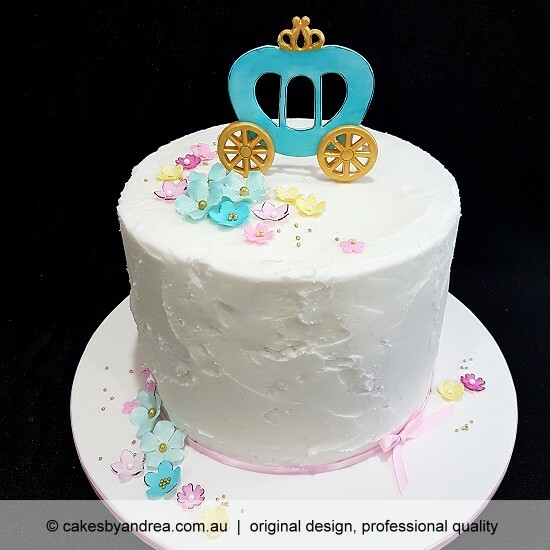 Princess Carriage) Budget tall birthday cake featuring princess carriage and assorted blossoms. Colour option: as shown. (2. 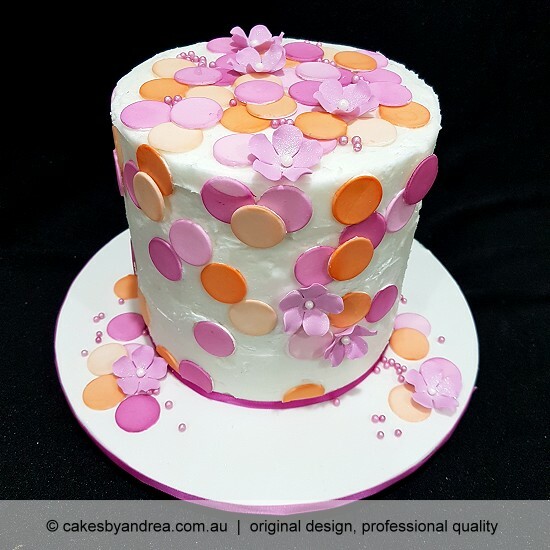 Coral Spots) Budget tall birthday cake, Mothers Day cake or for any celebration, featuring a fun collection of coral and pink spots, all hand painted and made from sugar paste (yum 100% edible), with pink blossoms and scattered sugar pearls. Colour option: as shown. (3. 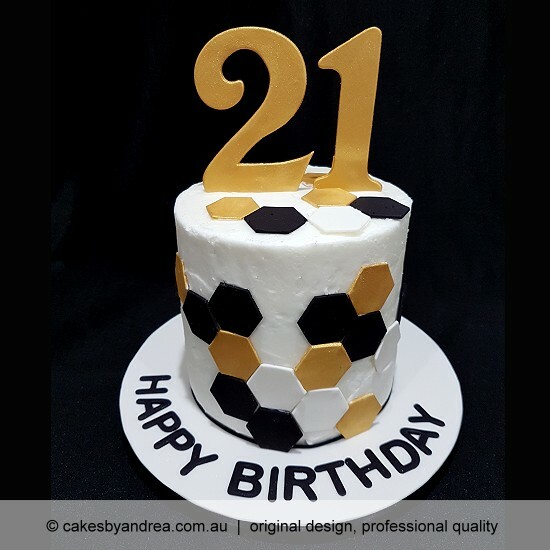 Hexagons & Number) Budget tall birthday cake featuring bold hexagon design and oversize age number, includes Happy Birthday inscription on board. A great design for guys and girls. Age number to suit occasion. Colour options: (a) Black, white, gold, as shown; (b) Black, white, blue; (c) Black, white, red; (d) Black, white, pink. (4. 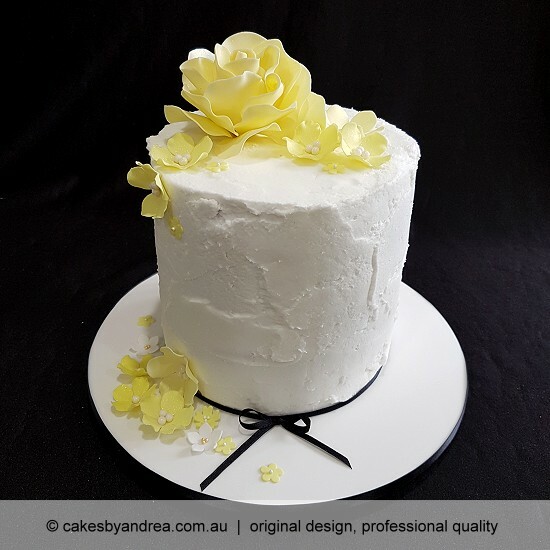 Rose & Blossoms) Budget tall celebration cake, Mothers Day or birthday cake featuring elegant handmade sugar paste rose and assorted blossoms. Ideal for any special occasion. Colour options: (a) Yellow, as shown; (b) Pink; (c) Blue; (d) Red. (5. 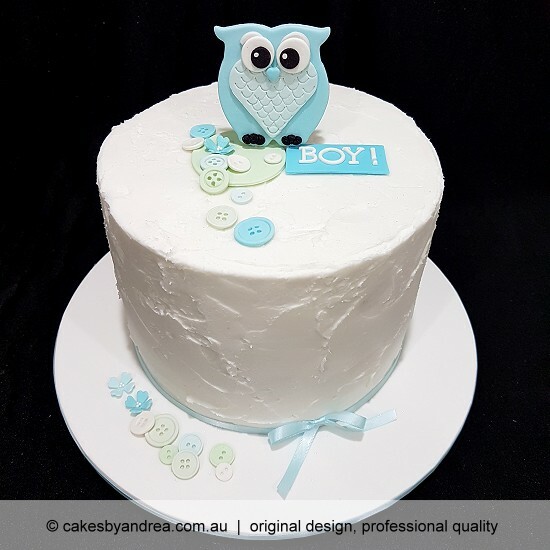 Owl & Buttons) Budget tall baby shower cake featuring cute owl and buttons or blossoms. Boy or Girl plaque to suit occasion. Colour options: (a) Blue with buttons, as shown; (b) Pink with blossoms. (6. 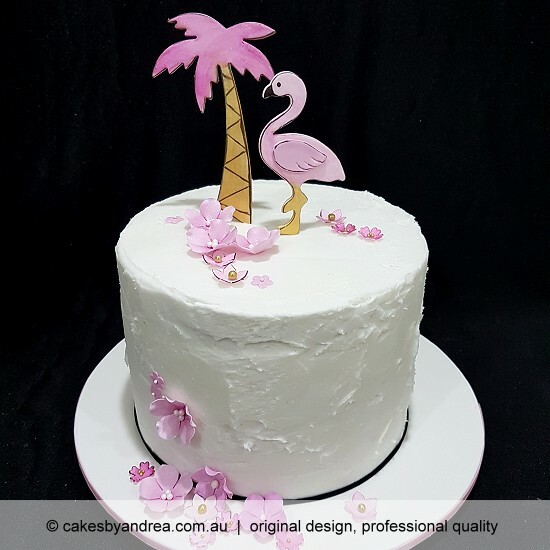 Flamingo & Palm) Budget tall birthday cake for any age, featuring hand cut and painted flamingo, palm tree and flowers. Colour option: as shown. (7. 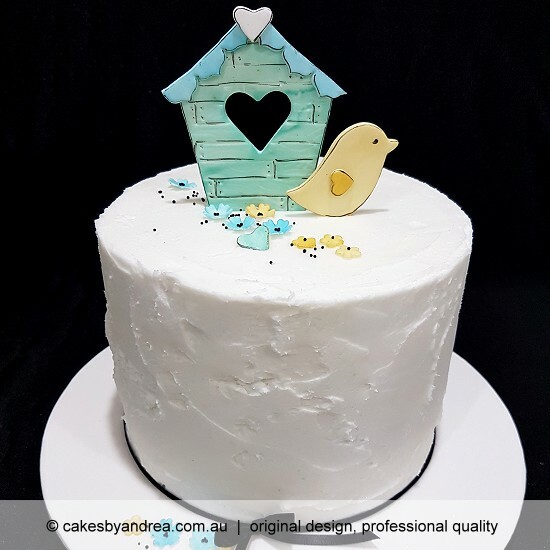 Bird & House) Budget tall celebration or birthday cake featuring hand cut and painted cute bird and bird house with cutout heart-shaped window. Colour option: as shown. (8. 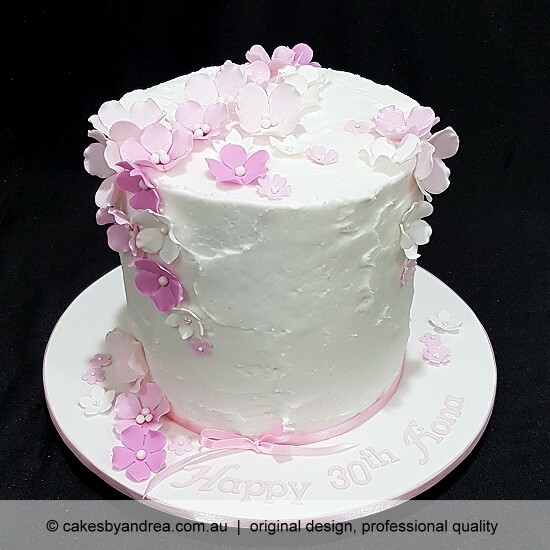 Scattered Blossoms) Budget tall celebration cake, birthday cake or Mothers Day cake featuring assorted handmade sugar paste blossoms. Ideal for any special occasion. Note: Inscription shown on the board is an optional extra. Colour options: (a) Pink, as shown; (b) Blue; (c) Red; (d) Yellow. (9. Shells & Starfish) Budget tall wedding, engagement or birthday cake featuring a collection of seaside components, shells, starfish, sand and gold pearls (all items are edible). 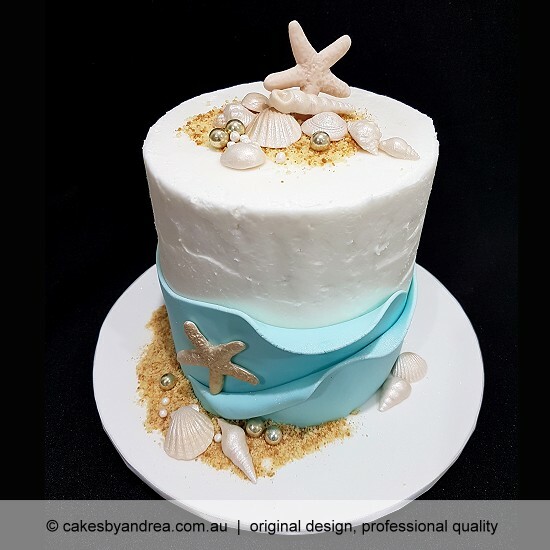 Pale blue fondant wraps around the frosted cake creating a wave-like effect. Colour option: as shown. (10. 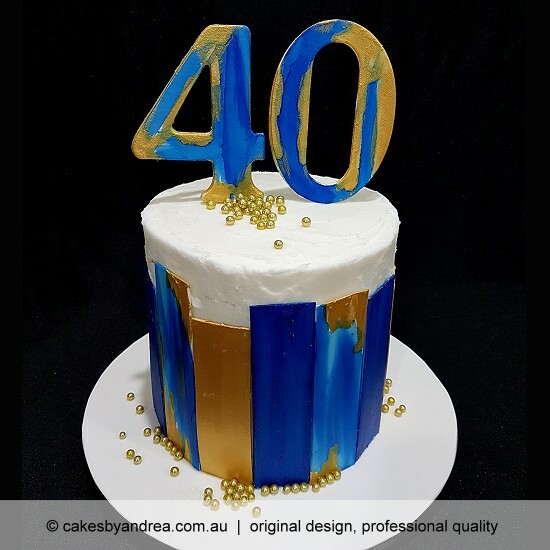 Stripes & Number) Creative hand painted water colour effect in hues of cobalt blue and gold on sugar paste panels, with oversize hand painted age number and scattered gold cashous creates a stunning cake. All decorations edible and handmade by Andrea. Age number to suit occasion. Colour option: as shown. (11. 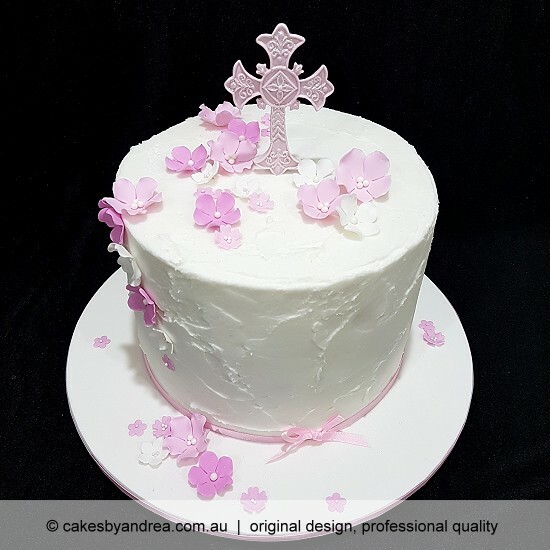 Christening Cross) Budget tall Christening cake featuring handmade cross and assorted blossoms or buttons. Colour options: (a) Pink cross with flowers, as shown; (b) Blue cross with buttons. Name inscription: Maximum of 25 characters, add $12.00 for all cakes, except for Hexagon birthday cake maximum of 10 characters add $8.00 (Hexagon design comes standard with Happy Birthday inscription as shown). The name/inscription will be hand cut from sugar paste and positioned on the fondant-covered board. Different colours: Standard colour options are included in each design description above. Other colour variations are available however they may incur an additional cost. Price will be advised by Andrea. Delivery: Delivery to your venue or home is available throughout Brisbane, subject to confirmation by Andrea. Delivery fees start at $40. Or pick up is available from Cakes By Andrea in Shailer Park. At which time between 9am-5pm Monday-Friday and 9am-2pm Saturday are you available for a brief phone call? This is needed to finalise your order details and payment. Note: A confirmation message will appear above the form after your details have been sent.